The HSP examples on this site are typical, solid examples of HSP in action; this is, after all, the Official Hansen Solubility website. Our colleague, Dr Hiroshi Yamamoto, has built up over the years the marvellous Pirika site (all these links open in a new page) which is full of computational tools for chemists, including many HSP-related tools that are free for all to use. For those lucky enough to read Japanese there is much more available in the Japanese-language Pirika pages. Here we refer only to some of his English pages. Because this is his personal site, Hiroshi can try out ideas that may or may not prove right in the long term (though so far his track record of being right is very high), and he positively welcomes feedback/criticism/suggestions. Many of the examples discussed on this site are covered in an adventurous fashion on Pirika and there are plenty of fascinating topics such as Solubilising gallstones, thinking about Cats and Mosquitoes or Cockroaches, wondering what the HSP might be of TiO2 and thinking not just about flavor scalping but whether HSP can help explain Flavour itself. Hiroshi is a man of many talents, including being an excellent Japanese chef. One day he made a significant error - he didn't do the HSP calculations before cooking. He wanted to make a large amount of chilli sauce. He knew that PE gloves are a great barrier to capsaicin the hot ingredient of chilli but they are sweaty and uncomfortable so he chose to use natural rubber gloves. The result is that his hands hurt for days afterwards. 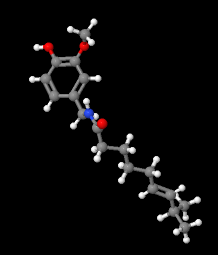 The HSP Distance between capsaicin and rubber is rather small, so the molecule easily penetrated the gloves. Had he used nitrile rubber gloves, all would have been fine! Contacting Hiroshi. Here's a translation of a note from Hiroshi to Japanese users of Pirika. "I get too much junk mail and automatically send emails from GMail, Yahoo etc. to the junk folder. If you use a real (corporate or academic) email address and use [Pirika] to start the Subject line then mail to me at hansen-solubility@pirika.com is more likely to be read."